Each person receives two dipping forks. Use the first one to skewer a piece of bread (or ham or broccoli) and dip your item in the pot of melted cheese. Stir the cheese just a little with your fork, and then bring it back to your plate where it cools for a moment while you prepare the second fork to dip another item in the pot. Repeat this process, and remember: never go straight from the pot to your mouth. Each morsel is dipped in the pot only once—no double dipping. 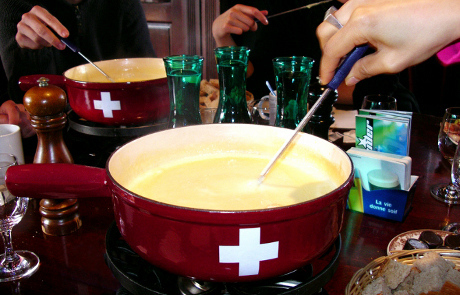 Swiss tradition says that if a man loses his dipping item in the pot, he buys the next round of drinks. If a woman loses her item in the pot, she must offer a kiss to her neighbors. Quaint, but possibly amusing. When the cheese is all gone, simply snuff out the burner with a large spoon. After everything cools, place the fondue pot, burner, and forks back in the provided container. We’ll make arrangements with you to pick up the container the following day. The dipping forks have sharp points. Fencing over who gets the next dip is not acceptable behavior. The pot is warmed by a gentle flame. Roasting marshmallows or bread or fingers in the flame is not acceptable behavior. "Accidentally" dislodging your neighbor's bread from their fork in order to claim drinks or kisses may be acceptable behavior in some circles. Use good judgement! Some groups might need to appoint a supervisor to divide the bread chunks fairly. Vegetarians and carnivores in your group might want to establish trading rules for ham versus broccoli. Amex, Visa, Master Card, Diners. Vail Valley also includes Beaver Creek, Bachelor Gulch, Arrowhead, Cordillera, and nearby.